Trump Wants To Use Iraqi Base To Watch Iran. Now Iraqi Parties Want U.S. Forces Out Parliamentary groups are pushing for a vote on the U.S. military presence in Iraq after President Trump said its Ain al-Asad base would serve as an Iran watch post. U.S. Marines preparing to build a military site in western Anbar, Iraq, in November 2017, as an outpost in the fight against the Islamic State group. With a single line, President Trump fanned the flames of a push in Iraq to expel U.S. forces, just as he declared he wanted to keep troops in the country. "We spent a fortune on building this incredible base. We might as well keep it," Trump said in a CBS interview on Feb. 3, referring to the Ain al-Asad military base in Iraq's western desert. "And one of the reasons I want to keep it is because I want to be looking a little bit at Iran because Iran is a real problem." The Pentagon has described the mission for the several thousand U.S. troops stationed at the Iraqi base as helping Iraq fight ISIS. Trump's comment has raised Iraqi fears that the U.S. could draw it into conflict with neighboring Iran. It has also left U.S. officials, including the acting defense secretary, scrambling to reassure Iraqi leaders that the United States respects Iraqi sovereignty. That wasn't the first time the president has mentioned this alternative motive. When Trump flew into the Ain al-Asad base for a Christmas visit, he told U.S. service members he planned to keep forces in Iraq to protect U.S. interests, monitor "any potential reformation of ISIS and also to watch over Iran." It also angered Iraqis who viewed Trump's failure to drop by Baghdad to meet the country's leaders as a breach of sovereignty. But those December comments, overshadowed by the surprise visit itself, failed to elicit the media coverage or the firestorm of criticism that Trump's later statement has drawn. While Iraq's prime minister maintains his country still needs U.S. military support, a number of Iraqi politicians want the U.S. out. Several opposing parties are now increasing efforts to move parliament to a vote on ending the U.S. presence when lawmakers reconvene in March. "We have submitted a proposal to parliament to cancel the agreement with the U.S.," Sabah al-Saedi, head of one of the biggest blocs in parliament, told NPR. "The remarks by President Trump show a lack of realization that such statements will increase mobilization to get American forces out of Iraq." The Trump administration has made limiting Iran a centerpiece of its foreign policy. Iraq, which has strong security, economic and political ties with Iran, has made clear that it will maintain those links. Iraq's 2005 constitution, drafted with the help of the United States, forbids using the country's territory to harm its neighbors. "The recent statements by the U.S. president on reasons for the U.S. military presence in Iraq reveal the real reason behind this presence," said a statement from Sairoon, the political coalition loyal to Shiite Muslim cleric Muqtada al-Sadr. "It has nothing to do with providing assistance to the Iraqi security forces but it is intended to use Iraq as a starting point to attack the interests of neighboring countries." Trump's remarks prompted public rebukes even from pro-Western Iraqi leaders. "Don't overburden Iraq with your own issues," said President Barham Salih, stepping out of his usual diplomatic phrasing. "The U.S. is a major power ... but do not pursue your own policy priorities. We live here," he said at a forum of an Iraqi think tank, the Rafidain Center for Dialogue, last week. Salih said the troops were in Iraq on a mission to fight ISIS and any other actions were unacceptable. He made clear that Trump had not discussed with Iraqi leaders using Iraq as a watch post. 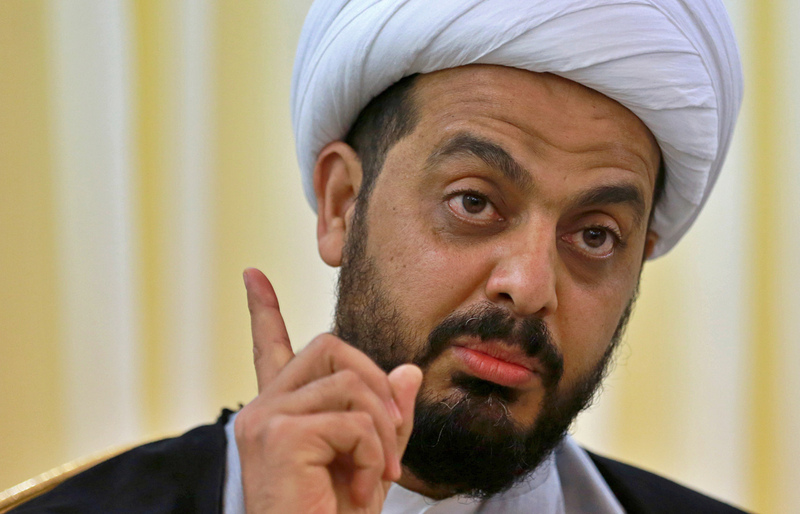 Even Iraq's most revered Shiite religious scholar entered the fray. Grand Ayatollah Ali al-Sistani, whose words carry immense weight in the country and who normally avoids political issues, emphasized that Iraq wants good relations with all countries without interference in its internal affairs. "Iraq rejects being a station for harming any other country," his statement said. Acting U.S. defense chief Patrick Shanahan tried to conduct damage control during a visit to Baghdad this week. U.S. military and State Department officials have also sought to make clear that despite Trump's having declared ISIS defeated, the militant group still poses a significant threat. 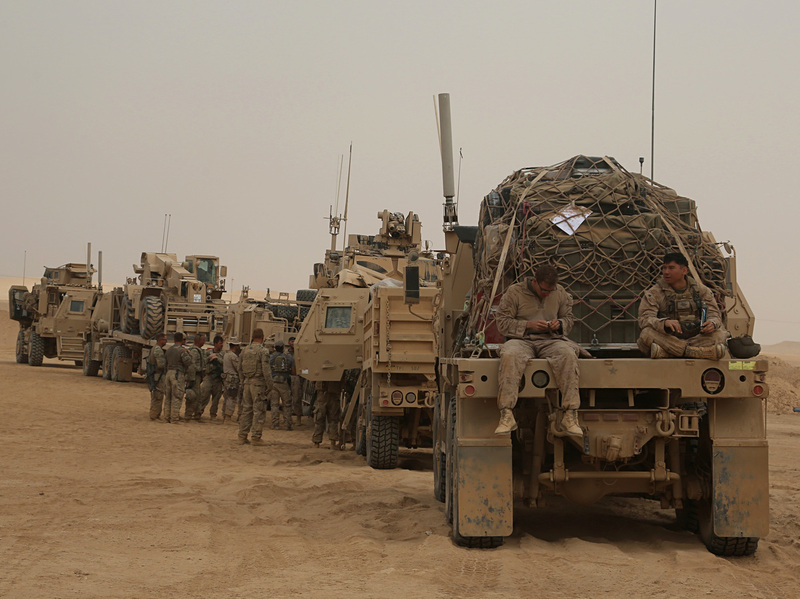 There are between 5,000 and 6,000 U.S. troops in Iraq as part of an agreement with the Iraqi government to advise, assist and support Iraqi forces in the fight against ISIS. The issue has put Iraqi Prime Minister Adel Abdul-Mahdi in a difficult position. Unlike previous parliaments, the current one has no majority coalition. Some of the most powerful of the diverse political blocs are Iranian-backed and have military wings. Qais al-Khazali speaks during an interview with The Associated Press in Baghdad, Iraq, on Jan. 28. He said he expects a vote by the Iraqi parliament calling for the withdrawal of U.S. troops from the country within the next few months. One of the most vocal critics of the U.S. military presence is Qais al-Khazali, head of a prominent Iran-backed militia called Asaib Ahl al-Haq. Khazali was jailed by U.S. forces for ordering an attack that killed five U.S. military personnel in central Iraqi city of Karbala in 2007. He was released in 2009 in a swap for British prisoners held by his group. "Trump should know that Iraq is a strong society," Khazali told NPR last week in Baghdad. He said that between Iraq's legislature and security forces, "they can expel those 5,000 [U.S. service members] from our country." Khazali and other Iran-backed Iraqi leaders, however, have said they don't object to U.S. personnel training Iraqi security forces. "Asaib Ahl al-Haq has 15 members of parliament and his militia has a long track record particularly during the [U.S.] occupation and the civil war of targeting American troops successfully, so it's not an idle threat," said Toby Dodge, a professor at the London School of Economics who advised Gen. David Petraeus and other U.S. military leaders in Iraq in 2007 and 2008. "I think this shows the almost certainly unintended consequences of what Trump has done," Dodge told NPR. "Parliament will almost certainly push through some form of largely symbolic law calling for American troops to go but then the devil will be in the details — are they trainers or troops?" Even supporters of the U.S. presence want more clarity about what exactly the troops are doing. "The U.S. helped liberate the country but there is no clear plan with the Iraqi government for what they will do after ISIS," said Jaber al-Jaberi, a former member of parliament. "There are still ISIS sleeper cells in the country. We had expected ISIS to reorganize themselves and prepare to be back in 2020 but they are already reorganizing themselves," said Jaberi, who is from Anbar province. "We still need the U.S. to stay because Iraq is not yet stabilized. But we have to organize this between two independent, sovereign countries."